Rare species violet. 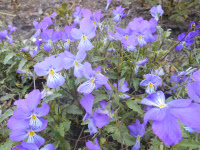 Clouds of blue violets with veined heart leading to tiny yellow centers from late spring thru fall-blooms its head off. Reliably perennial. More heat tolerant than pansies. 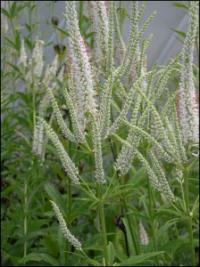 1st described by Swedish botanist Carl Fredrik Nyman before 1893. Wildlife Value: Violas are the sole food source for the caterpillar of Fritillary butterflies. Viola was named after a mythical young woman who Zeus loved and who Zeus’ wife harassed. Athens adopted the V. tricolor as its symbol. Pliny prescribed it for headaches in ancient Rome. Mentioned repeatedly by Shakespeare. 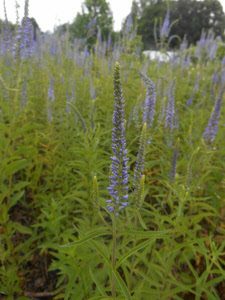 In the 1500’s the plant was used to make a medicinal tea to cure chest and lung inflammations, (Gerard) and later to cure impetigo and ulcers. When Napoleon Bonaparte died Viola tricolor found in his locket with a snip of Josephine’s hair. 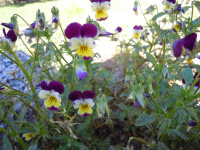 Thomas Jefferson imported Viola tricolor from France in 1767. Pressed specimen in Emily Dickinson’s herbarium.